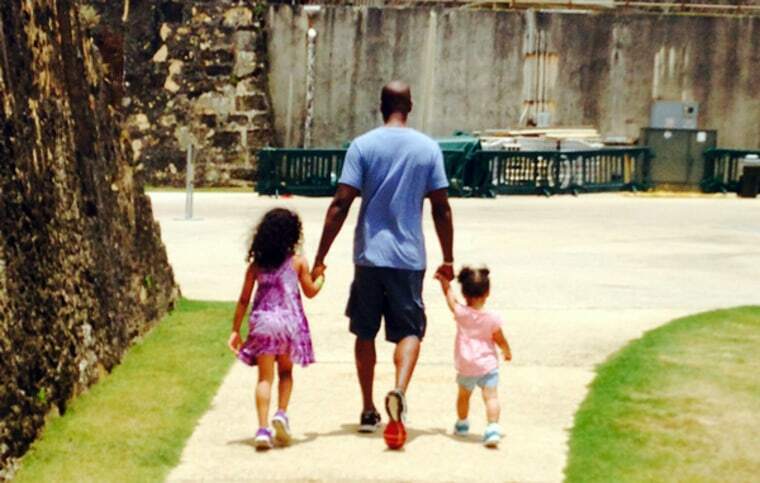 Doyin Richards takes a stroll with daughters, Emiko, 4 &amp; Reiko, 2. We’ve all heard the stereotype that Black fathers are disproportionately absent from the lives of their children — well that’s not true. A CDC study surveyed over 3,900 fathers between 2006 and 2010 and found that Black fathers were more likely to bathe, dress, play and dine with their children as compared to their White and Hispanic counterparts. While there is no way to generalize the role of fathers by race or ethnicity, one thing is clear; the positive influence of an active father is indispensable to a child’s success. What does it mean to be a Black father in 2015? Being a black dad in 2015 is complicated. In addition to managing toddler tantrums, diaper changes, and play-dates - I can't help but notice society's perception of me. When I'm with my kids, I get overwhelming praise due to the bar for black fathers being so low that you could trip over it. Internally, I'm like, "Hey, this is what I'm supposed to do. I don't want any props for this." Just to see how much my daughters trust me. They're young (4 years old and 2 years old), but I love how they trust me to comfort them when they're scared, to hug them when they're happy, to run to me for validation, or just to cuddle them when they want to feel safe. It's the greatest feeling ever—and if I could bottle and sell it, my retirement would be completely funded. James Ross' Jeremiah, now 9 years old, takes part in the action featuring his dad as Tyra Sanchez. If you could pick one thing about yourself to pass on to your child, what would it be? If I could pick one thing about myself to pass on to my child, it would be moral values. This includes being honest and trustworthy. Having integrity, being courageous and showing gratitude. Having the will to never give up and the ability to add value to this world. What lesson would you relay to other fathers? I would relay a lesson of patience to other fathers. I'd encourage them to always be patient with their children. Take time to breathe when you have to and remind yourself that it's all going to make sense to your child one day. What has been your greatest obstacle in fatherhood? For me it is being a single father. My daughter's mother passed away so it's hard knowing that there is a void I cannot fulfill. Nonetheless, my daughter is happy and as much as I wish things were different they are playing out the way they are supposed to. Enjoy the ride. Almost nothing turns out how we plan; but that makes the journey so much fun. If you have a son, know that you're the one he looks up to. If you have a daughter, you're her first love. As much as you are raising your children they are raising you. Justin Pye is a California-based multimedia journalist with NBC News. Since working for NBC, he has contributed to Dateline, Nightly News, TODAY and NBCnews.com. Pye is a former educator who graduated from Morehouse College and the University of California, Berkeley School of Journalism.